Yet again, we find ourselves reporting on popular #gift card scams, this time targeting those interested in travelling. 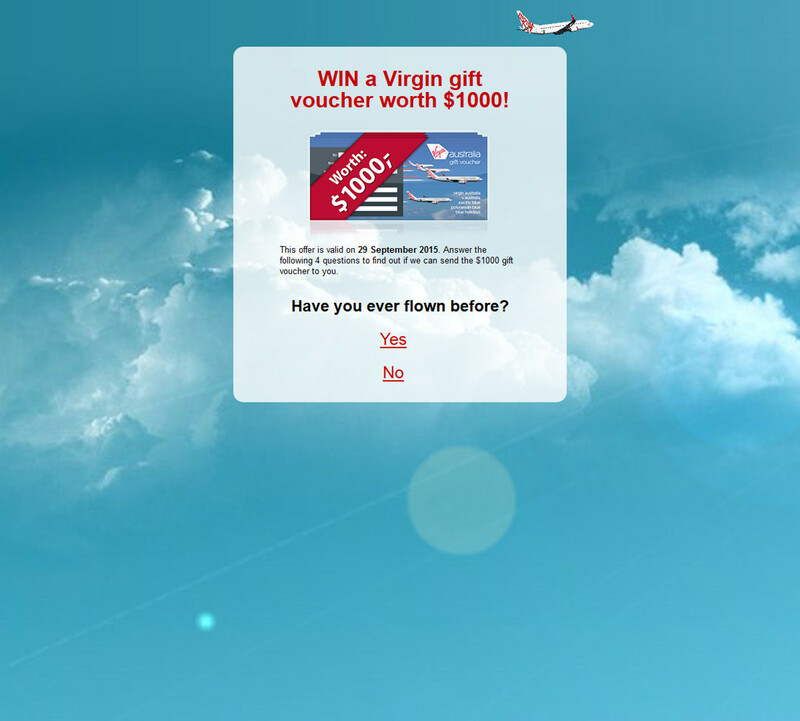 The email poses as Virgin, Australia’s second largest airline whose slogan is “Now you’re flying”. Keep reading to discover the dangers lurking in this email’s contents. Figure A is an accurate copy of the Virgin email in question. The first thing you will notice is a missing image which is a common mistake noted in scam emails. 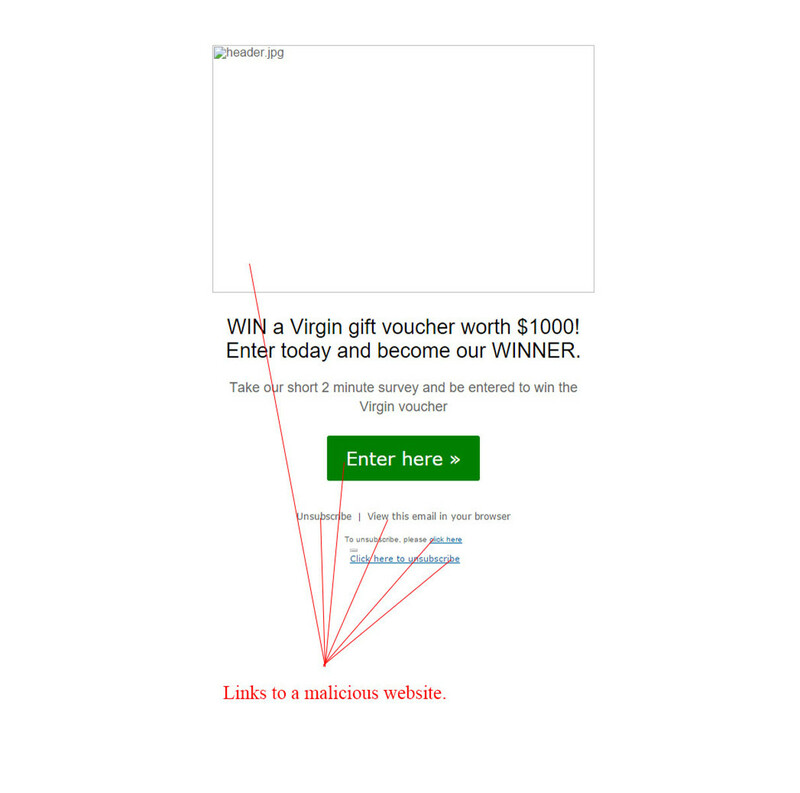 This email’s subject line reads “Win a Virgin Voucher” which entices the receiver to open it out of interest. The sender is shown as “Kelli”, which could be an attempt at a personal approach, however the email address used is in no way associated with the official Virgin Australia website. Within the email’s contents there are many prompts to get you to click through with the major one, a green call-to-action button. All of the links are malicious, including both unsubscribe hyperlinks at the bottom. Do not click anywhere within this email and delete it from your inbox. Figure B is the website you would land on if a link within the email is clicked. It is well branded and pushes you to click through to claim your gift voucher, said to be worth $1000. The offer normally has a valid “until date” which is a tactic to hurry your click through. On the page you will see the question “Have you ever flown before”? and two buttons to answer with yes or no, answering these questions and clicking these links will lead to a malware infection. We strongly suggest running your anti-virus software if you reach this page and delete the email straight away. Be very careful when it comes to any email, like this one, offering a freebie or gift voucher. It is extremely unlikely to receive a legitimate email of this nature and it is best to play it safe and delete it from your inbox. If you are ever in doubt, contact the official company directly to question it further and see any legitimate offers they have in place.